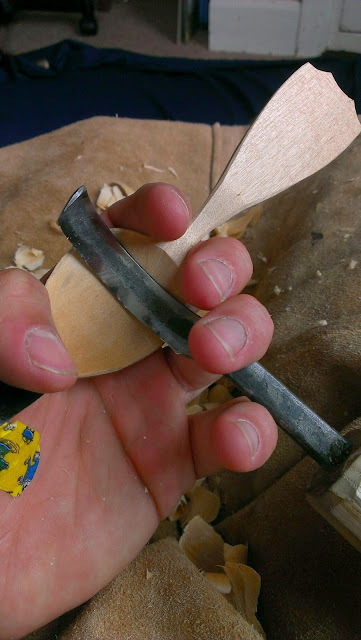 On Friday I made this spoon from a purple plum branch and shared it in a Facebook spoon carving group. I've mentioned before that the group is a great source of help and inspiration and the following spoon making journey is proof of that. 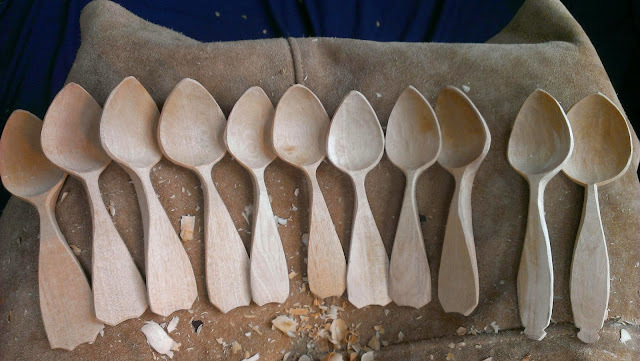 Jojo Wood, a fantastic spoon carver, whose work I admire, asked if the above spoon was inspired by the dolphin spoons made by a chap called Owen Thomas. I'm not particularly familiar with Owen's work and his dolphin spoons didn't feature as inspiration for the above spoon (turns out he was an apprentice of Barn the Spoon and does really nice bowls as well as making spoons). The above spoon was a bit of a mash up of aspoon I received from Jojo, a cherry spoon I bought from Jane Mickelborough and my own creative meanderings. 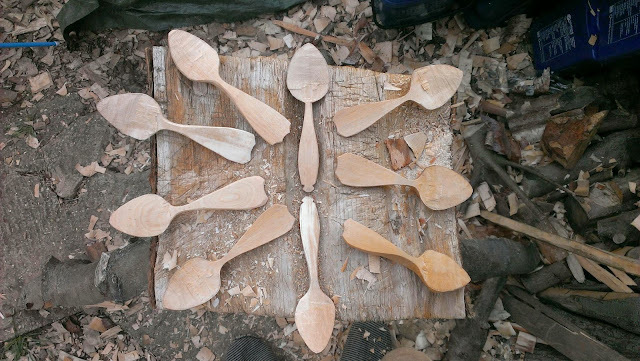 Initially influenced by the traditional Welsh dolphin spoons, these have developed into a shape of their own. For me, these spoons have moved quite a way from the traditional Welsh dolphin spoon design. I'd really like to have a chat with Owen at Spoonfest next weekend to find out more about the journey his spoon design went on. I actually quite like the look of the traditional ridge, and the aquatic shape it gives to the spoons. 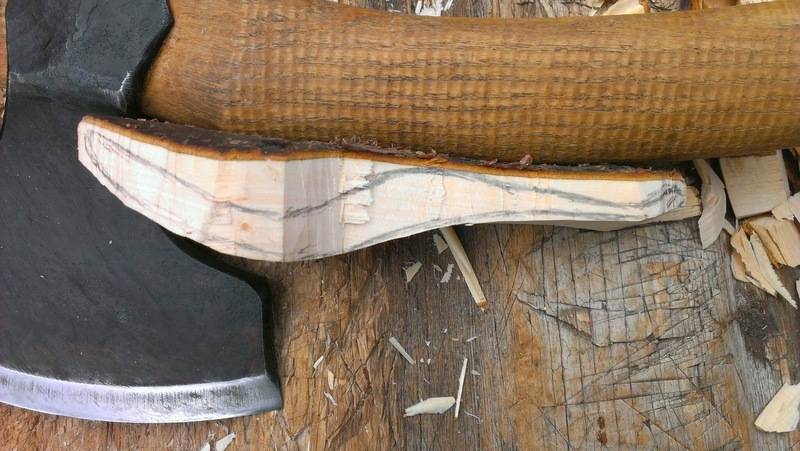 I ended up doing quite a bit of desk-based research into the traditional dolphin spoonand they all seem to share that ridge and a wide, up-swept end to the handle. 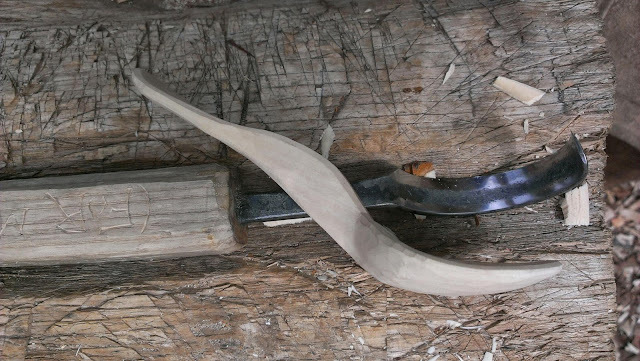 So, the inspiration for this spoon comes directly from the traditional Welsh dolphin spoon, but via a comment by Jojo Wood, the work of Owen Thomas and a spoon I carved that had nothing to do with a certain aquatic mammal. I used some purple plum branch wood for this spoon. Traditionally they seem to be mainly sycamore, but plum is what I've got, so plum is what I use. The design is based on the various images of traditional Welsh dolphin spoons I found. 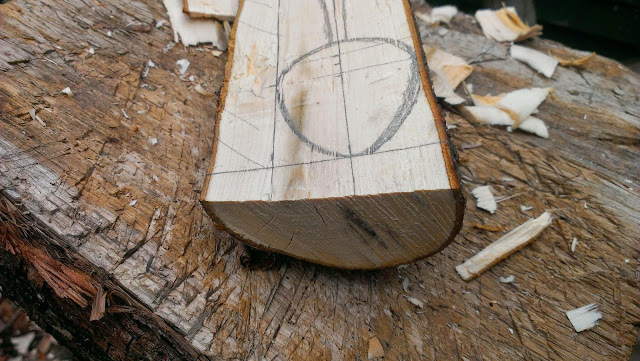 I drew it off-centre due to the asymmetrical shape of the branch wood. Here's the top view after rough shaping with the axe. For me, the key feature of a dolphin spoon is in the profile view, the top of the thin stem is raised, akin to a dolphin's dorsal fin, and the wide, flat end of the handle mimics the dolphin's tail. The bottom of the spoon roughed out, following the pencil lines as closely as possible. 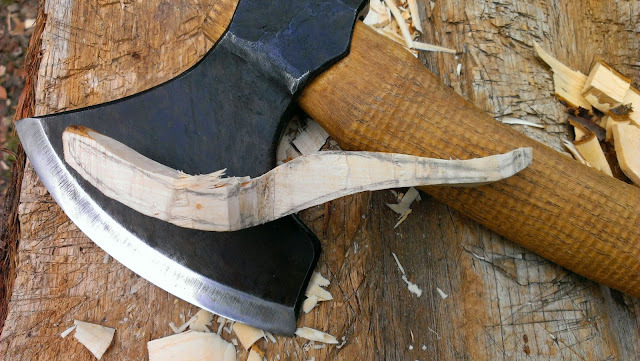 Here's the spoon after I've finished with most of the axe work. I did some rough shaping of the underside of the bowl with the axe before moving onto the knife work. Here is my finished dolphin spoon, the bowl on this traditional Welsh design hollowed out with a traditional Welsh tool, the twca cam. The side profile shows the raised 'dorsal' stem. I feel that I could have done more to exaggerate the lift at the end of the handle, but the upward sweep is there. Not bad for my first attempt. 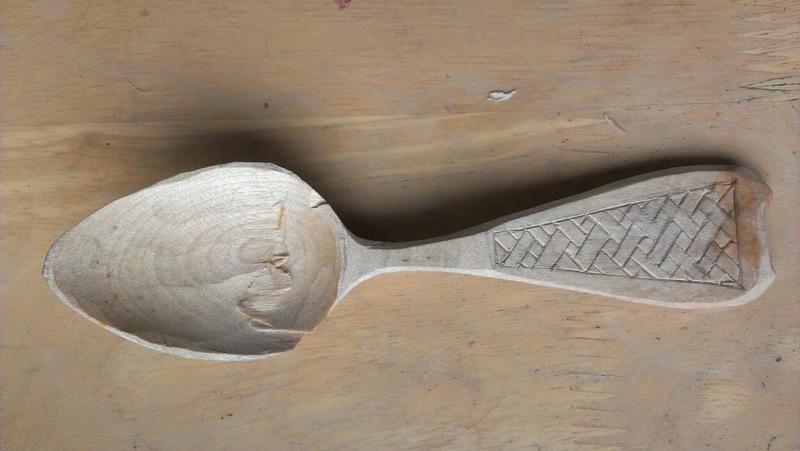 It actually felt nice to carve a traditional design native to the UK after focusing on Swedish style spoons for so long. I think I'll have a look into other traditional British designs. 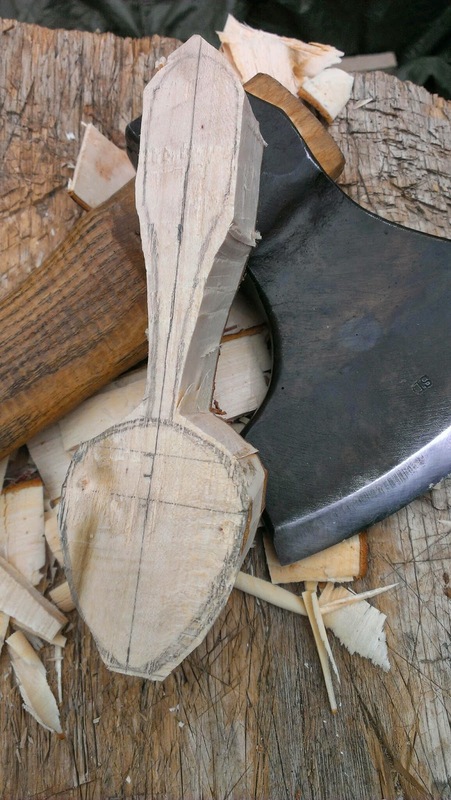 If you have any suggestions for traditional British spoon styles, please let me know. Got down to some serious carving over the weekend. 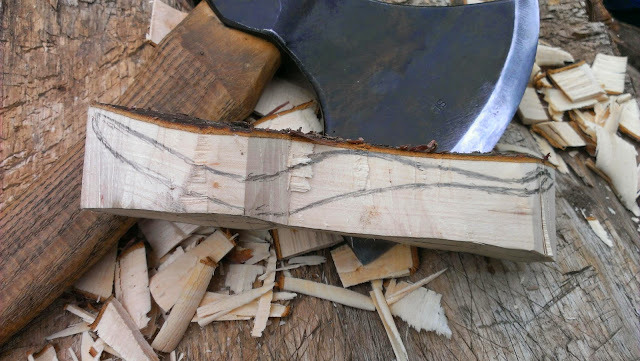 I axed out the spoons on Saturday (and a couple extra on Sunday), used the knife to smarten up the handles and the underside of the bowls yesterday and today I used the twca cam to hollow out the bowls. There were a few hiccups along the way and a few minor adjustments to make, but I'm really happy to have been able to be as productive as I have. Using the Nic Westermann twca cam. 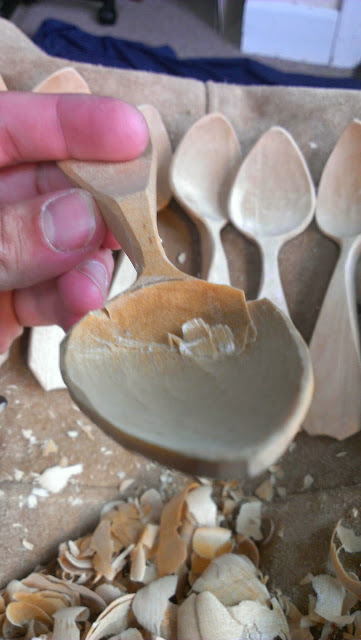 Used the failed spoon for kolrossing practice.